The Bosch brand is all about precision engineering combined with energy efficiency. The WTVC4500UC is no exception to the rule, boasting of the EcoAction option that helps in reducing energy consumption by 10%. Even with energy savings, the dryer manages to perform its task to perfection for every load, even when it contains all sorts of fabrics. With the use of EcoSmart sensors, the Bosch WTVC4500UC dryer is able to perform each of its tasks efficiently. As mentioned earlier, the dryer model has an EcoAction option. This option allows a load to be dried efficiently even when energy consumption is slashed by 10%. The WTVC4500UC dryer is just fitting into the image of Bosch as the Energy Star partner in 2009. Emitting sounds at 67 dB, the Bosch WTVC4500UC dryer is considered one of the quietest dryers in the United States though not as quiet as those from the Bosch Vision 500 series. Because of this, the user can expect quiet operation, with limited vibration. The inclusion of several cycle options provide the user a means to dry delicate fabrics safely. WrinkleBlock technology makes it possible to take away or prevent wrinkles. There are even cycles that are designed to simply refresh, and some that are designed to remove odors. These cycles may be compatible with loads that the user has forgotten to remove from the machine for quite awhile. The dryer performs its job efficiently, without having to use extreme heat. In fact, it is described to make use of its DynamicAir feature. This feature enables the dryer to make use of high air volume and moderate heat to dry a load. The Air Fluff/No Heat cycle takes things a little further, by performing drying without using heat at all. As with most other Bosch dryers, the WTVC4500UC is stackable. It can be placed on top of or under another appliance, most likely or preferably a Bosch washing machine. This characteristic helps it in fitting in to almost any size of room. The dryer is made of sturdy materials. The stainless steel tub is natural for high quality dryers. The manufacturer wants to use a material that does not rust. Other parts are made of chrome and silver, also durable and attractive-looking materials. A dryer rack is included in the product package. The rack provides delicate fabrics a place to be laid down and dried. The Bosch WTVC4500UC is energy efficient. It makes use of features that help make that possible. The dryer performs its functions not just with competence, using the least energy possible. Quiet operation helps in getting other jobs done inside the house, especially jobs that need concentration. The dryer is packed with features and cycle options that make it customizable according to the needs of a particular load. 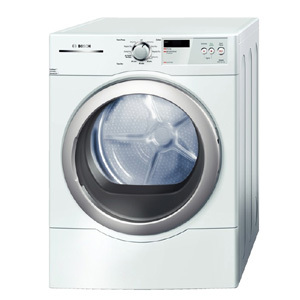 On the surface, the dryer cannot be easily distinguished from other Bosch offerings. It takes careful analysis of the specs to recognize the WTVC4500UC. There is no fabric-specific cycle designed for active wear.